For a successful world economic system we need some fundamental changes that respond to the changing nature and expectations of society. Capitalism has to become more robust, more acceptable and more sustainable. Managers and Leaders Who Can provides a vision and road-map for making sense of the new world we live in as it affects management and leadership. 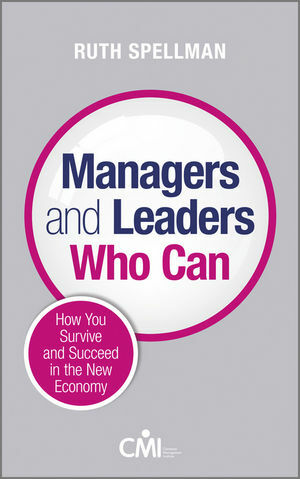 Looking at the new economic and social circumstances of the post-recession world and examining the implications holistically for management and leadership, for governments, employers and individuals alike, this book provides practical guidance and illustrations on how to take forward the development challenge on a national, organisational and individual level. As Chief Executive of the Chartered Management Institute (CMI), Ruth Spellman OBE leads the drive to encourage greater focus on the high level skills needed to build UK competitiveness and productivity. She is responsible for the Institute's campaign to raise standards of management and leadership focusing on the skills, attitudes and behaviours which our economy needs to survive and compete in the 21st Century. Prior to joining the Institute in June 2008, Ruth held a succession of high profile roles. She was the first female Chief Executive of the Institution of Mechanical Engineers (IMechE); Chief Executive of Investors in People UK (IIPUK) for seven years where she made IIP a respected brand both in the UK and overseas; she Chaired the National Training Organisation (NTO) for the voluntary sector in England and held a number of non-executive roles. Prior to that she was HR Director for the NSPCC following five years with Coopers and Lybrand, where she headed up the HR consulting practice in the Eastern region. In 2007 Ruth was awarded an OBE in the New Year Honours List for services to workplace learning. She was voted 14th out of the 100 most influential HR individuals in the UK. She was made an Honorary Doctor of Science at Cranfield University in June 2010, holds an MA from Cambridge University and describes herself as a serial lifelong learner. On taking on her role as CEO of the CMI in 2008, she set a clear priority to raise the profile of the organisations through clear messaging, first class research and providing a range of accessible services for members and employers alike. The CMI is the only chartered professional body in the UK dedicated to promoting the highest standards of management and leadership excellence. Chapter 1: Values and ethics. Chapter 2: Managing yourself and leading others. Chapter 3: Managing change and uncertainty. Chapter 5: Risk and business continuity management. Chapter 6: Managing the environment. Chapter 8: Managing brand and reputation.